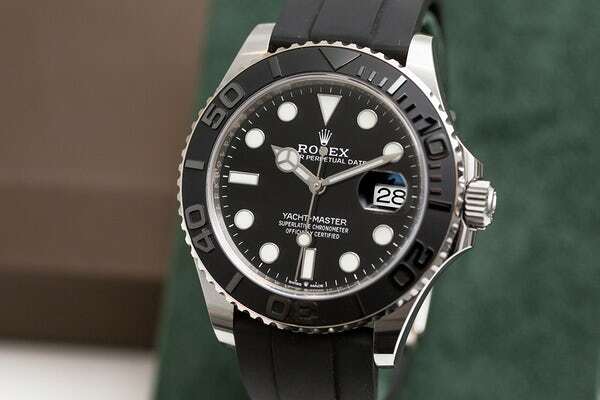 This is the first time that Rolex has launched a 42 mm time-and-date Yacht-Master. 2 mm may not be much but it has made a significant difference and the new watch is not just a larger variant of the 40 mm Yacht-Master. It offers the stylish combination of a black dial and a bezel fashioned from white gold with a matte black Cerachrom insert. The markings on the insert are raised and polished for an eyecatching look. The watch is powered by the caliber 3235 movement, which is Rolex’s most advanced time-and-date movement and is paired with the white gold Chromalight hands made of white gold and the 3 o’clock date window. The watch is water resistant to 100 meters and is a bigger, sleeker version of the Everose gold Yacht-Master. The case made of white gold and the matte black bezel will stop conversation wherever you go. The Oysterflex bracelet with its safety clasp will hold the watch in place and is practical and casual.